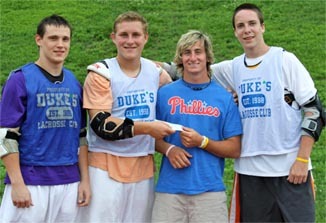 Every year Dukes Lacrosse Club & Friends award The Peter Ortale Scholarship to players in the previous graduating class that exemplify tradition, sportsmanship and community service during their high school career. 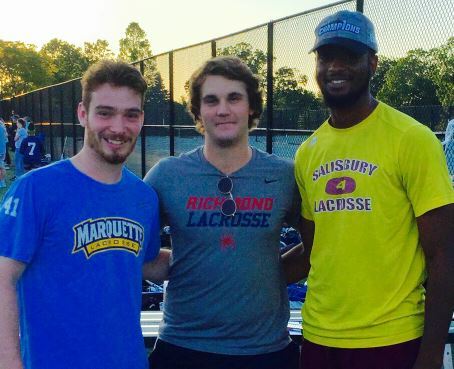 Penncrest’s Ryan Granger (rising sophomore at Marquette), Harriton’s Matt Binnion (rising sophomore at Richmond) and Shipley School’s Amir Fluellen (rising sophonore at Salisbury) have been named recipients of the annual Peter Ortale Memorial Fund Award by the Duke’s Lacrosse Club for 2016. The scholarship awards of $1,000 may be used toward their college expenses. Granger (defenseman) redshirted at Marquette this year, Binnion (defenseman) redshirted at Richmond and Fluellen (midfielder) was a valuable reserve for the Division III National champion Sea Gulls. The Award was created both to honor Ortale – a former Duke’s player and Penn Charter standout who passed away while working at the World Trade Center in the 9-11 terrorist act – and to support the Duke’s mission to support tradition, sportsmanship and community service. Granger, Binnion and Fluellen were chosen for their positive attributes and contributions to the Duke’s LC. Ortale, a Penn Charter graduate, starred at Duke. Ortale was 37 years old and working as a securities broker for Euro Brokers Inc. when the World Trade Center was attacked. Granger and Binnion were first-team All-Central League First-Team picks in 2016 and Fluellen was a First-Team All-Friends Schools League selection. In addition, Binnion was a Second-Team All-Phillylacrosse.com selection and Granger was a Third-Team pick as well as an All-EPLCA pick. 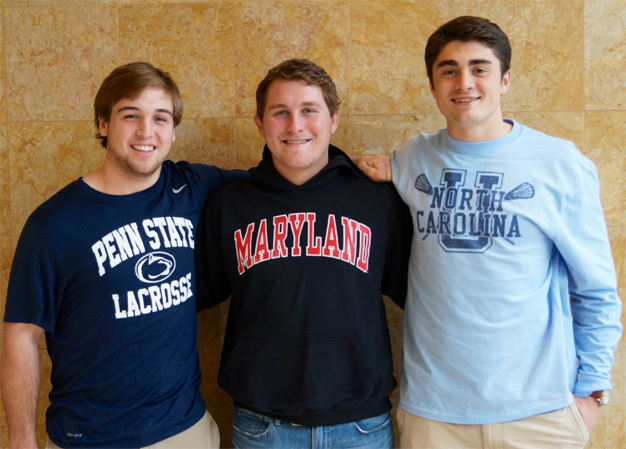 Malvern Preo’s Drew Schantz, Salesianum School’s Ryan Kern and Tower Hill’s Andrew Pettit have been named as recipients of the annual Peter Ortale Memorial Fund Award by the Duke’s Lacrosse Club for 2015. The scholarship awards of $1,000 may be used toward their college expenses. 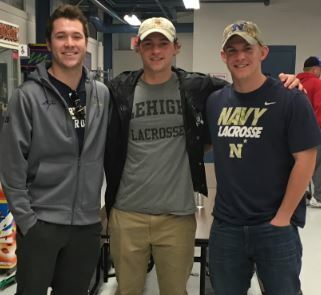 Kern (goalie) is playing lacrosse at Navy Prep this year, Pettit (attackman) is playing at Lehigh and Schantz (midfielder) at Notre Dame. The Award was created both to honor Ortale – a former Duke’s player who passed away while working at the World Trade Center in the 9-11 terrorist act – and to support the Duke’s mission to support tradition, sportsmanship and community service. Kern, Pettit and Schantz were chosen for their positive attributes and contributions to the Duke’s LC. Ortale, a Penn Charter graduate, starred at Duke. Ortale was 37 years old and working as a securities broker for Euro Brokers Inc. when the World Trade Center was attacked. Kern was the Phillylacrosse.com Delaware Co-Player of the Year (along with Pettit) and led Salesianum to the state championship in 2015. He was a US Lacrosse All-American. Pettit, aside from his Co-Player of the Year honor, was a US Lacrosse All-American and First-Team All-State pick. He had 59 goals and 42 assists, leading the Hillers to a berth in state semifinals. Schantz was a US Lacrosse All-American who had 27 goals, 13 assists, and 64 groundballs and led the Friars to a tie for second in the Inter-Ac League. Avon Grove’s Will Schreiner (now a sophomore goalie at Penn State), Salesianum School’s Freddy Freibott (now a sophomore defensemen at Ohio State) and Wyomissing’s Scott McAvoy (now a sophomore at Lafayette) have been named as recipients of the annual Peter Ortale Memorial Fund Award by the Duke’s Lacrosse Club. The award was from the 2014 high school season. The scholarship awards of $1,000 each may be used toward their college expenses. The Award was created both to honor Ortale – a former Duke’s player who passed away while working at the World Trade Center in the 9-11 terrorist act – and to support the Duke’s mission to support tradition, sportsmanship and community service. Schreiner, Freibott and McAvoy were chosen for their positive attributes and contributions to the Duke’s LC. Schreiner was a US Lacrosse and Under Armour All-American, and had a .64 save percentage, a 5.34 goals against average and 237 saves in 2014. He led the Devils to the District 1 title and a PIAA finals berth. Freibott was a US Lacrosse All-American and First-Team All-State pick in 2014 who collected 83 groundballs and seven goals. He helped the Sals reach the state final. McAvoy earned US Lacrosse Academic All-American and All-Berks First Team in 2014. He was a member of the National Honor Society and was an AP Scholar. Abington’s Austin Pifani, La Salle’s Matt Rambo and St. Augustine Prep’s Michael Sutton have been named as recipients of the annual Peter Ortale Memorial Fund Award by the Duke’s Lacrosse Club. The scholarship awards of $1,000 may be used toward their college expenses. Pifani (defenseman) is playing lacrosse at North Carolina this year, Rambo (attackman) is playing at Maryland and Sutton (midfielder) at Penn State. Pifani, Rambo and Sutton were chosen for their positive attributes and contributions to the Duke’s LC. Ortale, a Penn Charter graduate, starred at Duke. Ortale was 37 years old and working as a securities broker for Euro Brokers Inc. when the World Trade Center was attacked. Last year Pifani earned US Lacrosse All-American honors, played in the Under Armour Senior All-American Game and was All-Phillylacrosse.com while leading Abington to the District 1 playoffs. Rambo was the Phillylacrosse.com Player of the Year in leading La Salle to the PIAA state championship. Rambo also was the Under Armour Senior All-American Game MVP and a US Lacrosse All-American. Sutton was a US Lacrosse All-American who also played in the Under Armour All-American Game. Last year’s winners of the Peter Ortale Scholarship were Abington’s Ryan Ambler and Garnet Valley’s Ryan Guittare. In 2011 the winners were Chestnut Hill Academy’s Corbin Booker and Penn Charter’s Joey Sankey. In its inaugural year, Avon Grove’s Tim Golder and Upper Merion’s Nate Hare were the recipients. Abington’s Ryan Ambler and Garnet Valley’s Ryan Guittare have been named as recipients of the annual Peter Ortale Memorial Fund Award by the Duke’s Lacrosse Club. The scholarship awards of $1,500 may be used toward their college expenses. Guittare (defenseman) will play lacrosse at Penn State this year and Ambler (attackman) will play at Princeton. Ambler and Guittare were chosen for their positive attributes and contributions to the Duke’s LC. Ortale, a Penn Charter graduate, starred at Duke. Ortale was 37 years old and working as a securities broker for Euro Brokers Inc. when the World Trade Center was attacked. This year Ambler earned US Lacrosse All-American honors and was All-Phillylacrosse.com while collecting 46 goals and 48 assists. He helped lead Abington to the District 1 quarterfinals. This year Guittare was named to the Under Armour All-American team and earned First team All-Central and High Honorable Mention All-Phillylacrosse.com honors. He helped the Jaguars to the District 1 championship game and a berth in the state tournament. Last year’s winners of the Peter Ortale Scholarship were Chestnut Hill Academy’s Corbin Booker and Penn Charter’s Joey Sankey. In its inaugural year, Avon Grove’s Tim Golder and Upper Merion’s Nate Hare were the recipients. Penn Charter senior attackman and Chestnut Hill Academy senior goalie/midfielder Corbin Booker have been named as recipients of the annual Peter Ortale Memorial Fund Award by the Duke’s Lacrosse Club. Peter Ortale Memorial Award winners for 2011 are Penn Charter's Joey Sankey (second from right) and Chestnut Hill Academy's Corbin Booker (not pictured). Accepting the scholarship awards for their teammates are Duke's L.C. captains and All-Americans (from left) Bryan Garrrahan (Archmere Academy), Matt Rambo (La Salle), and Ryan Ambler (Abington). The scholarship awards of $1,500 may be used toward their college expenses. Sankey will play lacrosse at North Carolina next year and Booker will play at Brown. Sankey and Booker were chosen for their positive attributes and contributions to the Duke’s LC. Ortale, a Penn Charter graduate, starred at Duke. Ortale was 37 years old and working as a securities broker for Euro Brokers Inc. when the World Trade Center was attacked. This year Sankey earned US Lacrosse All-American honors for the second year in a row and was named to the Under Armour All-American Team. He had 58 goals and 51 assists and led the Quakers to a 12-11 season and a berth in the Inter-Ac Invitational semifinals. Sankey also was instrumental in organizing a major fund-raising program called “Score for the Cure” to raise money for the family of teammate Shane Carr, whose father, Dan Carr, the popular Philly lacrosse supporter, passed away just before the season began. Booker has been a standout at both midfield and goalie for Chestnut Hill Academy and the Dukes L.C. He plans to study Media Broadcasting at Brown. Last year’s inaugural winners of the Peter Ortale Scholarship were Upper Merion’s Nate Hare (Robert Morris) and Avon Grove’s Tim Golder (Penn State). Avon Grove senior attackman Tim Golder and Upper Merion senior attackman Nate Hare have been named as recipients of the Inaugural Peter Ortale Memorial Fund Award by the Duke’s Lacrosse Club. The scholarship awards of $1,250 can be used toward their college expenses. 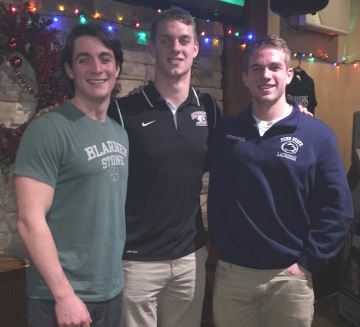 Golder will play lacrosse at Penn Sate next year and Hare will play at Robert Morris. Golder and Hare were chosen for their positive attributes and contributions to the Duke’s LC. Ortale, a Penn Charter graduate, starred at Duke. Ortale was 37 years old and working as a securities broker for Euro Brokers Inc. when the World Trade Center was attacked. Peter K. Ortale, a former Penn Charter and Duke University lacrosse standout who was killed in the attacks on the World Trade Center on 9/11, was recently remembered in a special article by his former college professor on Duke Today. Ortale, of Northeast Philadelphia, was 37 and working for Euro Brokers on the 84th floor of the South Tower on Sept. 11, 2001. Ortale served as a captain for the Duke Blue Devils in 1987 and was a two-time All-Atlantic Coast Conference player. At Penn Charter, he was a two-time All-American and led the Quakers to the 1983 state championship. 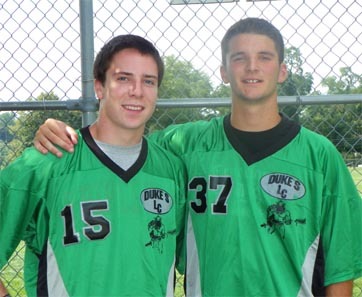 Ortale’s character and spirit are also remembered through the Duke’s Lacrosse Club Peter Ortale Scholarship, which has awarded college scholarship money to four Duke’s players since it was created in 2010. Professor Michael Gillespie recalls a former student who died in the Sept. 11 attacks, and explores the struggle between good and evil. Editor's Note: Michael Allen Gillespie is the Jerry G. and Patricia Crawford Hubbard Professor of Political Science at Duke. DURHAM, NC - Ten years ago, more than 3,000 people from many different countries had their lives snuffed out by an act of evil. The thousands who died in the collapse of the World Trade Center towers, in the Pentagon and aboard the four planes that were the instruments of this destruction remain, for the most part, faceless to us. On this anniversary, I would like to call back to memory one of the dead, our former student Peter Ortale. J. Peter Ortale was one of six Duke alumni who died in the 9/11 attacks. In the aftermath, Duke Magazine published short profiles as a memorial. Peter was a great deal like many Duke students. He came to Duke from a working-class, Catholic family in northeast Philadelphia to play lacrosse and get an education. He was good looking, with dark brown hair and dark eyes. He didn't care much about how he dressed, usually showing up to class in a battered sweatshirt. He was a great athlete and especially excelled at lacrosse, winning all-ACC honors and serving as captain of the team. He had an exuberant personality. He liked to party and he loved to compete. He clearly enjoyed the social life at Duke. What distinguished Peter from almost all of the other students I have had at Duke over the last 30 years, however, was his utter dedication to learning and his complete indifference to grades. Peter always wanted to take the most difficult and challenging courses, from my graduate seminar on European nihilism to Russian. As his adviser, I often suggested that he give himself a break, but he always gave me a little quiet smile and told me he'd think about it, and we both knew that meant no. Those courses were one more mountain to climb and Peter had to measure himself against it. Even though he knew he couldn't make it to the top, he was happy with the views he got from one or another precipice on the way. The other thing that set Peter apart was his constant efforts to impart this same enthusiasm for learning to his friends and particularly the members of his lacrosse team. He was always hauling them along to one class or another, encouraging them to join him in the serious pursuit not of good grades or a college degree but of a challenging and fruitful education. He brought several of them to my various classes and while they seldom had any preparation for the subject matter, Peter always managed to convince them they would be better for the challenge. After Duke, Peter traveled for a while, played lacrosse on a variety of club teams in both the U.S. and abroad, and went to work on Wall Street. He was 37 and working for Euro Brokers on the 84th floor of the South Tower on Sept. 11, 2001. After the attack, he made three phone calls: to his wife, his mother and a friend in California before heading for the stairs. He did not reach the bottom. I remember writing a letter of recommendation for Peter in 1987. I don't remember all of the details and the letter itself is long since lost or laid aside. However, I do remember remarking that if I ever had a son, I would want him to be like Peter. My son Tom was born in the fall after Peter graduated and is actually somewhat like Peter. I don't know that a father could ask for anything more. I only hope that he becomes as good a human being as Peter and has as positive an impact on those around him. I have often confronted the question in class whether there is a real difference between good and evil, or whether all values are not relative to particular cultures or particular historical periods. It seems to me that the events of Sept. 11th provide us with a simple but concrete answer to this question, and that this answer is captured in the differences between Peter Ortale and those who murdered him. Peter took great joy in helping and encouraging others; Osama Bin Laden and his henchmen took great pleasure in killing them. Where decent human beings mourn and cry, they celebrate and laugh. In killing Peter and all the others, these murderers struck a blow against humanity and against good men and women everywhere. As dramatic as this blow was, however, I cannot help but believe that the good that Peter and all the other victims of 9/11 did in life will ultimately outshine the evil of those who destroyed them.